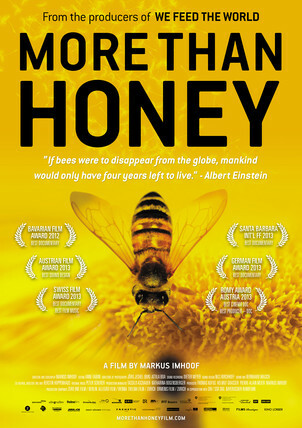 On Wednesday April 2, Sudbury Valley Trustees will show the movie More than Honey, followed by a conversation guided by Wayland backyard beekeeper Kaat Vander Straeten. At Wolbach Farm, in Sudbury. The movie “More than Honey” brings into sharp focus man’s many relationships to honeybees: as economic cash crop, as savior of humanity, as the canary in the coalmine. It does this in the context of the alarming decimation of the bees. In the US, the latest estimates suggest that 1.5 million out of 2.4 million total beehives have disappeared across 27 states in what is known as colony collapse disorder. There is good reason to be worried: the mainstays of our diets, most vegetables, and almost all fruit and grain crops, require pollination by the honeybee. After the movie, Kaat will lead a discussion and will suggest many actions each of us can take to save the bees, and ourselves. Kaat Vander Straeten has been a backyard beekeeper for five years and founded the Wayland BEElieve group, which unites and advocates for local beekeepers and bees. Co-sponsored with Transition Wayland. Free event, but registration is required. Register here.